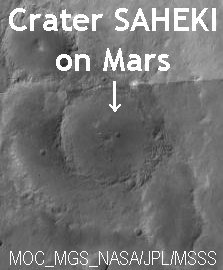 According to a recent communication from Dr Bradford A SMITH to Mr Takeshi SATO, SAHEKI's name has been put on an 85 km crater on Mars based on T SATO's proposal in 2001. It is provisional at present, while it was approved by the IAU Working Group: Final approval by the IAU will be given on the occasion of the IAU General Assembly which will be held this summer in Prague. As for Tsuneo SAHEKI (1916-1996), a short account was recently given in the "Sky & Telescope" December 2005 issue by Bill SHEEHAN and Masatsugu MINAMI: SAHEKI's work on the flares on Mars has been in the limelight. 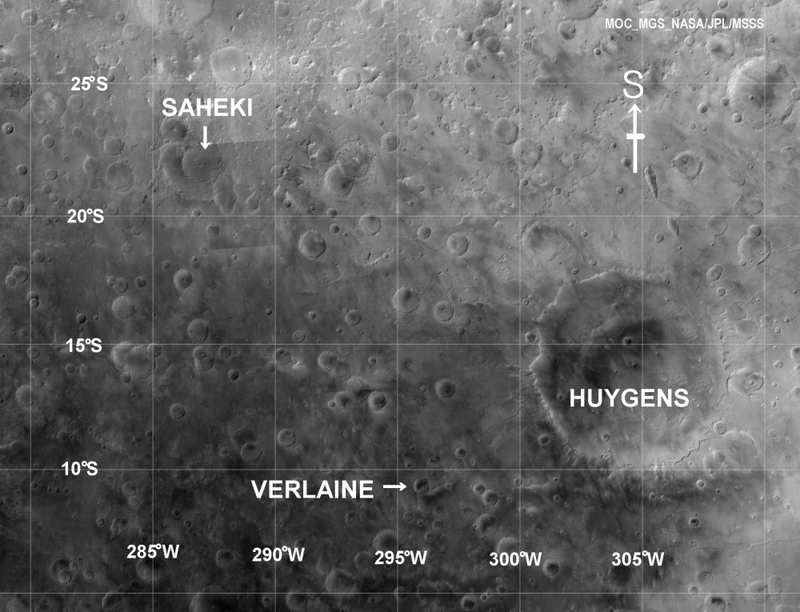 He was known as a Mars observer who had a keen eye on Mars, and first of all his discovery of a small isolated spot to the north-west of Syrtis Mj in 1937 is a legendary tale told even now here in Japanese Mars observer world: The spot was confirmed by E C SLIPHER by the photographic work in 1939, and later was named Antigones Fons (in the S&T issue, though the phrase was given by M MINAMI here, the spot was given erroneously an adjective "bright" while any Fons on Mars is a "dark" spot. The route to and from Noto taken by Percival LOWELL in 1889 is also quite different from that on the map shown in the same issue of S&T. It does not show the "Tenriugawa" river route which was one of highlights of Percival LOWELL's trip on his return from Noto). Tsuneo SAHEKI long directed the OAA Mars Section, and his short biography is given in this CMO Site (click here) which was once given as Obituary in CMO #175 (25 May 1996 issue). The first issue of the CMO was published on 25 January 1986 (the planet Mars was closest to the Earth on 16 July 1986 with maximal δ=23.2"), and hence this year we celebrate the 20th Anniversary: CMO #315 (25 January 2006) was the memorial issue. We published the memorial issue (CMO #171) of the 10th Anniversary on 25 January 1996, from which we have had the corner of "Ten-Years Ago." This CMO-Web-Site started from June 1996, and so we soon celebrate the 10th Anniversary of the CMO-Web. The planet Mars is now gone. On 1 July, the apparent diameter δ went down to 3.9 arc seconds, and already not very far from the setting Sun. 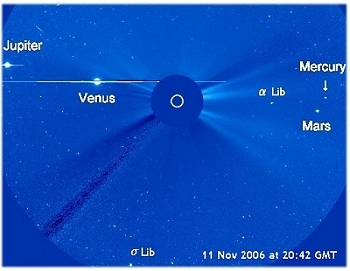 The planet will be at conjunction with the Sun on 23 October 2006, and then it will move to the morning sky. On 1 January 2007 it will recover δ=3.9 arc seconds again showing the surface of φ=3°N while its season will be at λ=159°Ls. The δ will increase to 10 arc seconds on 6 October 2007 while λ=325°Ls with φ=5°N. The planet will be closest to the Earth on 18/19 December 2007 GMT and δ will reach the maximal 15.9 seconds of arc when λ=004°Ls: It will be at opposition on 24 December 2007. The planet Mars has now come back to the eastern sky. According to the Almanac, Mars was at conjunction on 23 October 2006 at 7 hrs GMT. Now LASCO C2 shows the small planet coming out to the east. The apparent diameter will acquire δ=3.9" on 1 January 2007 with the Martian season at λ=159°Ls. The planet Mars is now a bit separated from the Sun in Libra. At present four of the planets haunt near the Sun. The planet Jupiter is soon at opposition on 22 November. Here is a LASCO C3 image on 11 Nov.